Football scarves are a great item alongside your club ties. 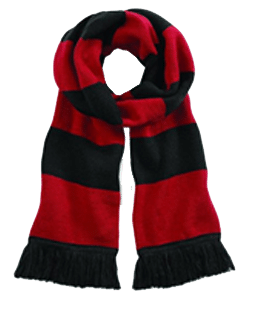 Our most popular choice of football club scarves are our knitted scarf options which are generally sold to fans and supporters attending club matches, either sold at the club or on their official website. For a quotation on your design or just a general chat on what custom football scarves you’re looking for, call us on 01922 612888 for friendly advice and helpful ideas based on our years of football team scarves experience. We can provide a free visual of your club scarves to see how your design will look before placing your bulk order. Our inhouse artist Karen who regularly designs custom made football scarves will create a number of designs based on your ideas or similar work we have made previously. As well as custom soccer scarves, our ladies style neck scarfs have become increasingly popular for female employees requiring matching neckwear to the men’s club tie. These can be produced alongside your club tie order or standalone copying your existing tie to match. Call us today on 01922 612888 to take your team scarves enquiry forward.